Hi everyone- TGIF! I have a huge post to share today- all of my favorite things that I did during my three days in Tokyo, which is the first city I visited in Japan. It was so hard to choose just a few places to share, but I hope that this will help show the incredible activities that Tokyo has to offer. I'll be sharing my six favorite activities / areas, as well as four places we ate. Unfortunately, I'm not much of a foodie when I travel, and my main goal is to explore as much as possible and save on food. I still hope my list is helpful for some random options to try, but to be honest- most of the time we just grabbed a quick bite at 7-Eleven or from the numerous street vendors around the city. It seems like you can't go wrong with food as I loved everything I tried! Here are my favorite things I saw / did / ate in Tokyo! I visited this museum on my first full day in Tokyo, along with Dan and two of his coworkers, and we all agreed that it was one of the most amazing experiences we've ever had. The entire museum is full of lights and projectors that transport you to different worlds- from an underwater oasis filled with brightly colored whales and frogs, to a field full of flowers that changed shape and color as you walked past. 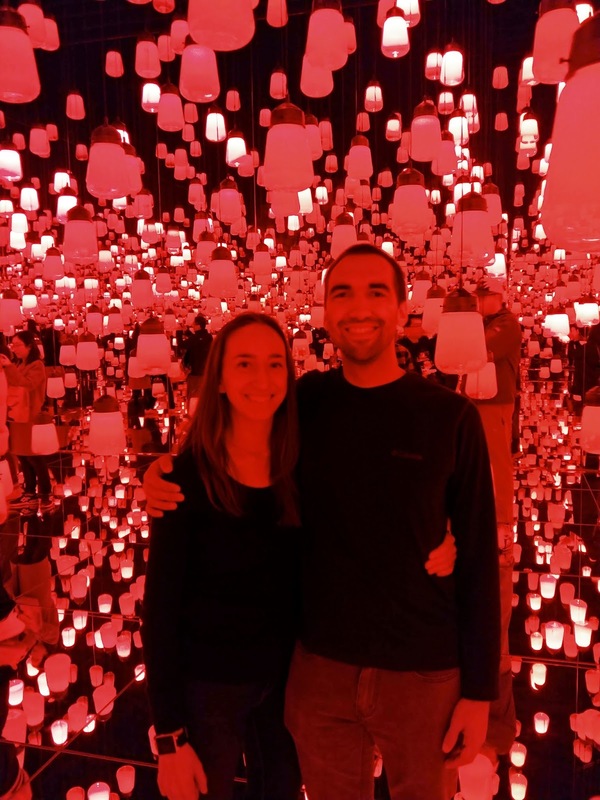 There were so many rooms to explore- my favorite was a mirrored room with thousands of lily pads that displayed shimmering lights one minute and tiny birds the next- as well as interactive exhibits that forced you to climb poles or go down slides. It's definitely a place that you have to experience for yourself! I knew that I wanted to get a good view of Tokyo (I love going to observation towers or decks when visiting new cities), and luckily our hotel was right across the street from one that just happened to be free! We went during the day as well as at night, and it's incredible to see just how vast the city of Tokyo is. All around us the town seemed to go on and on! I also enjoyed seeing all of the marketing for the 2020 Tokyo Olympics around the building, which makes me want to go back next year to watch the Games. When planning out our plan at the beginning of each day, Dan and I pretty much just decided on an area to explore, got off the subway or train at that stop, and followed whatever caught our attention. I knew that I wanted to visit Harajuku after hearing so much about it (mostly through Gwen Stefani's Japanese phase in the early 2000s- I even bought all of the perfumes and CD's), and it was incredible! There is a main pedestrian street at the entrance of Harajuku station called Takeshita, which is just crammed full of shops and food stands. An important concept across Japan, but was especially prevalent in Harajuku, is "kawaii", which roughly translates to "cute, adorable, and lovable". There were lots of stuffed animals, cute t-shirts, Disney stores, and colorful foods. We made a stop at an ice cream shop that makes animal themed cones, which is a perfect representation of the Harajuku spirit that we saw. There were so many things I loved about this shrine, including the fact that it was in the center of a huge, beautiful park located minutes away from the hustle and bustle of Harajuku and offered a welcome relief from the crowds. On the way to the shrine, you pass by a huge display of sake barrels- which are there as an offering of the enshrined deities of Meiji Shrine. The sake is donated from local brewers and used at ceremonies and festivals! Besides the stunning buildings in the shrine complex (which are all free to visit), there is also a garden which you can explore for a few hundred yen. Since we were in Japan during Christmas season, I knew we had to visit some of the light displays. Even though Christmas is not a recognized holiday like it is in the United States and other countries, I still saw lots of people dressed up as Santa, displays in windows, and decorations all over the place. I was shocked to also hear Christmas music everywhere! One of the most famous illuminations in Tokyo is located at Roppongi Hills, which is a really neat shopping, business, and residential area. There was a Christmas village (modeled after German markets), an entire block filled with sparkling blue lights, and a little park with decorations as well. This was another area that we decided to get off at the station and just explore! Besides Akihabara (which is a very similar area located close to Tokyo Station), this is the other famous otaku district in Tokyo- an area dedicated to people with specific interests in manga and anime. There were so many comic book stores, video game cafes, maid cafes, and more! We actually played some games in one of the video game places, which had six floors, each dedicated to different types of games. Everyone in there was INSANELY good- it was entertaining just watching them play Dance Dance Revolution or Pachinko (which is a game I never heard of before, but we saw hundreds of stores all over the country just to play Pachinko). We played a much easier game that was probably meant for children but we had a blast! This was actually the very first thing that I did in Tokyo after landing. Dan met me at the airport (he was in town a few days before me after working in Guam, so I flew alone), and we had to run through the airport to activate my Rail Pass, get seats on the Narita Express to get into Tokyo, and make it to the train in time for our reservation since my plane landed 2 1/2 hours late. It was really exciting- Dan kept yelling back at me "LET'S DO THIS AMAZING RACE STYLE" and we jumped into the train just as it was about to pull out. The cafe is near Tokyo Station, so I left my luggage in a locker at the train station and made our way to the building. There was a large store with all kinds of Pokemon gear and toys, which we explored until our time slot started. Once inside, we were seated in a themed section (we got Snorlax) and ordered food on an iPad. I wasn't particularly hungry, so I just got a donut and latte, while Dan got a Jigglypuff Cheesecake and float. The food wasn't particularly good and was one of our more expensive meals, but the entire experience was cute and the place was adorable- my first experience with kawaii! We apparently missed out on the characters coming out, but I was just ready to head to bed by the time we finished eating. Just a note- there are two parts of the fish market in Tokyo, the inner and outer market. The inner market was recently moved, and this is where the daily fish auctions take place (you might have heard about a recent $3 million tuna that was sold a few weeks ago). The outer market is what I visited, which is full of tons of street vendors and restaurants selling super fresh fish and sushi. We came after most of the shops had closed, but I heard it's a great experience to come early for breakfast! In Japan, one of my favorite foods was Okonomiyaki, which is basically a savory pancake with all kinds of delicious fillings. At this place, we got all of our ingredients in a bowl, and read instructions on cooking our own meal on a hot plate in the center of our table. Not only was the food delicious, but it was also a really fun experience! I mentioned in my last post how much I loved the food floors at department stars, and Tokyu Food Show in the Shibuya station was my favorite. There were so many different types of foods from sushi to fresh bread to macarons! It's a really fun experience just to walk around before (or after) you grab a train. What do you prioritize- food or experiences- on trips?